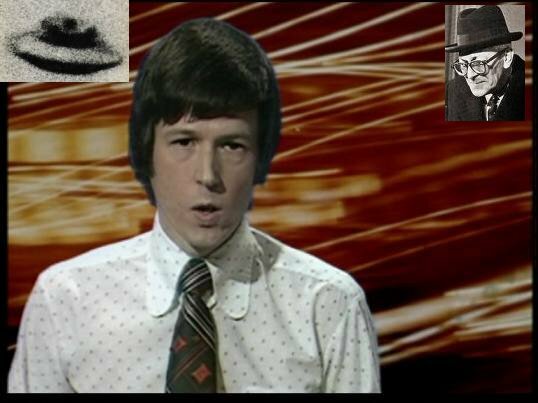 In the early hours of 24th January 1974 John Craven had a profoundly disturbing experience. Craven presenter of the BBC's Newsround programme was buying a cup of tea at a motorway service station south of Birmingham. He could have done with something a lot stronger than tea! A few minutes earlier in the service station car park, he had noticed several Army vehicles, surrounding them where a number of soldiers. In particular his attention was drawn toward a covered lorry, he could hear the voice of the commanding officer coming from the rear of the lorry, "For Christ's sake man! Get that thing sealed now!". Craven walked 20 yards or so in the direction of the lorry, hanging out of the back at a precarious angle was a metal box some 7ft by 3ft. It was then that Craven caught a glimpse of the contents, what he saw literally stunned him; it was a creature, a creature from another world! Craven was numb with shock, he felt himself to be in a strange dreamlike state. As he waited for his tea, Craven failed to notice the cadaverous figure standing next to him. "Mr Craven?" came the rasping voice, "Mr Craven? ", "Erm yes." replied Craven. The strange figure that now confronted Craven merely added to his fear, tall thin, with a skeletal face, the sinister individual took a long drag on his cigarette,a dark smile spread across his face. "Mr Craven, I am an avid viewer of Newsround." The man who spoke to Craven was James Jesus Angleton the CIA's head of counter espionage. "I'm very glad " said Craven, his discomfort barely hidden. Taking his cup of tea Craven made his way to an empty table by the window that overlooked the front section of car park, Angleton followed. "I never miss a programme," said Angleton "you have to be congratulated on the quality of the journalism." Craven sat down and glanced nervously out of the window, Angleton joined him, "Don't you find that there are certain things, that on reflection it is probably better not to know?" mused Angleton, "I beg your pardon!" came Craven's startled repone. Stubbing out his cigarette, and then immediately lighting another, Angleton chuckled to himself, "I expect you know that only too well." Craven gulped at his tea, "I don't quite understand." he murmured. Angleton turned toward the Window, "You, saw something here tonight, you are one of only a handful in the entire world to have seen it. It is very unfortunate that you did see it. We are both of us in a rather difficult situation." A cold wave of fear washed over Craven, he knew that it was pointless to deny that he had seen the creature. "In difficult situations one needs the support of friends, don't you agree?" Angleton flicking his ash grinned at Craven. "In order for us to help eah other, you should be in possession of the facts. At about 9 p.m. last night an incident occured at Llandrillo, North Wales. A craft of extra-terrrestial origin crashed on Cader Berwyn"